This guy is injury prone. Yup, talented kid, but maybe a bad pick. Bummer. Just gotta hope that it’s a minor issue, he’s a Important piece on this team, it would be a complete bummer if he’s out for a while. Kentavious Caldwell-Pope will undergo an MRI for a potentially broken nose after being elbowed in the face yesterday. Everybody but Josh Hart (Achilles) participated in full practice today, including Julius Randle. As such, everybody else available vs Clips. So excited that we are a healthy going into the season, hopefully Hart can comeback soon. Just stay HEALTHY. The injuries to Hayward, Green, and Lin in the first game for their teams have me spooked. Hart (Achilles) has been ruled out for Friday's season opener against the Clippers, Mike Bresnahan of Spectrum SportsNet reports. 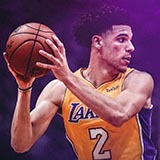 Lonzo Ball is off the Los Angeles Lakers' injury report and has no health-minutes restrictions heading into the season opener against the LA Clippers on Thursday night. I’ll check the Twitters later in the day but as of right now no injuries reported. UPDATE: Thomas Bryant recalled for tonight’s game. Digging this thread by the way. Kuz is being reported as a “game time decision” due to his hip.